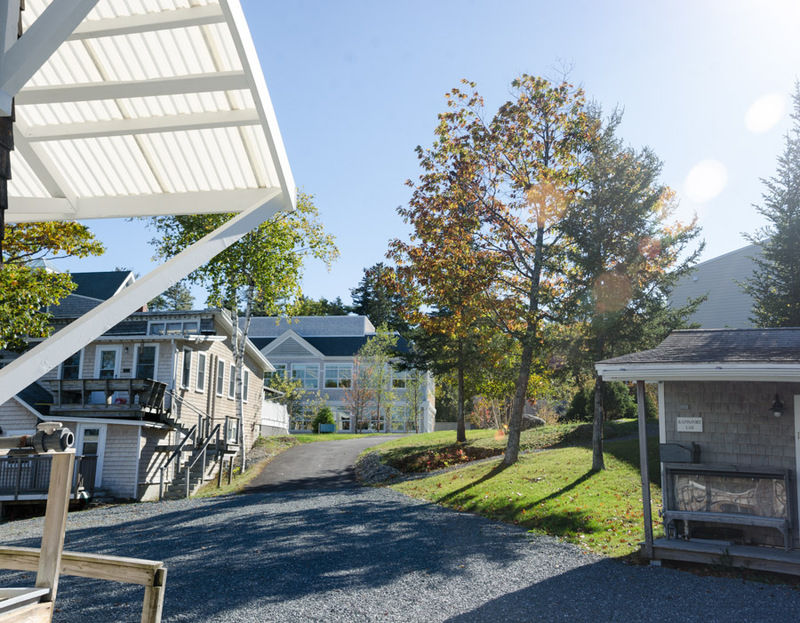 Dr. Jane Disney is the Director of Education for the MDI Biological Laboratory. On October 18, 2017, we walked down to Star Point at the Bio Lab for a chat. It was 66°F, sunny and brisk with a strong wind gusting out of somewhere northwest-ish. I’ve known Jane for a few years through the Frenchman Bay Partners, a coalition of people working in and around the bay, and back when I first dreamed up the Coast Walk, she was one of the people who helped me think it through and encouraged me to make it real. She mentors a lot of people that way, officially and unofficially, and I was looking forward to catching up with her. That’s Star Point in the background – from certain angles the hole is star-shaped. The wind was to strong to sit out on the dock. Jane: The Anecdata project has really been expanding. [Ed. note: Anecdata.org is a citizen science website designed and run by Jane’s department.] … We were invited by the Margaret Chase Smith Policy Center to submit an article to the Maine Policy Review [that was] an audit of all of the projects in Anecdata. We contacted different project leaders to find out how their projects were progressing, if they felt they were meeting their goals. We got so many interesting stories from people. 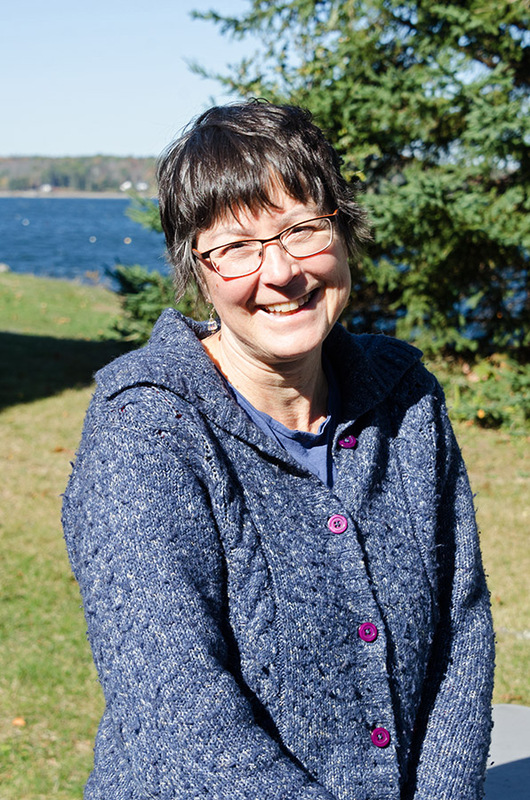 … There’s a woman named Gail McCullough who used to work with Frenchman Bay Conservancy. … All her adult years she’s been tracking seals, so she had a lot of data in journals that she wanted to make publicly available. She has been meticulously going through and integrating that data into Anecdata. At the beginning of her project she had all hand-drawn sketches of seals, because she started in the 1980s, then as time went by she got a digital camera. 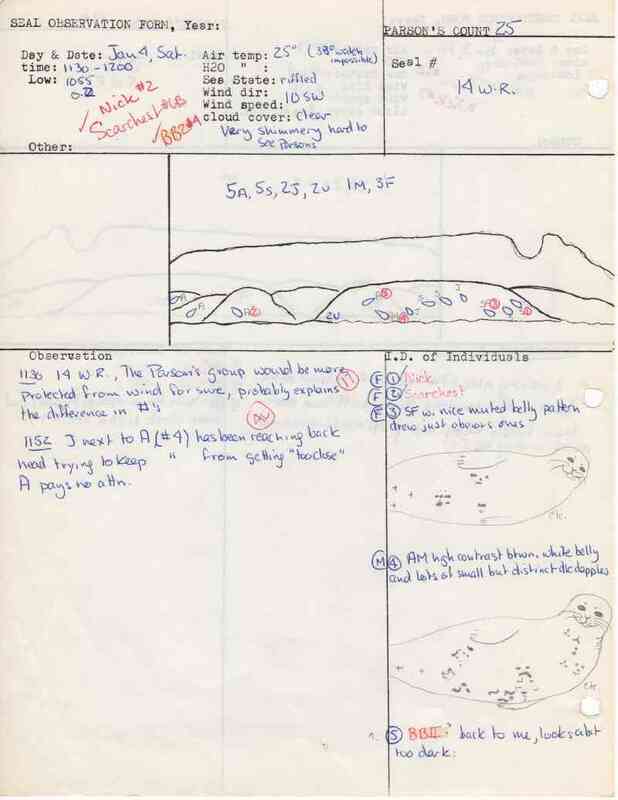 … It’s serving as an archive of historical data on seals, which is really wonderful. … Seal populations were quite depleted. After the Marine Mammal Protection Act went in [Ed.note: in 1972], they started to recover, and then Gail got interested in tracking that recovery. She looked at seals that were on exposed ledges at low tide, and [others] that seemed to be returning to rock outcroppings that were out of the water at high tide, so she had these low tide and high tide location users. The same ones came back to the same places year after year. … She’s been a citizen scientist, in essence, all these years, collecting this data by herself. [Massachusetts Audubon] was tracking meadowlarks. When I contacted them and said, “How’s it going?” they sent me these amazing maps that they had made for reporting out to their project participants. [They used the] presence/absence data [function that] is why we made Anecdata to begin with. We wanted to show where eelgrass was and wasn’t, and on most websites that were available for citizen science data, you could only put in what was present, but there was no way to indicate missing information. [Mass Audubon] had a present/absent [question], so you ‘did or not’ see meadowlarks when you went in these areas. Then you could see how many areas where you couldn’t see them, versus areas where you could. Then they’re tracking over time how that map is going to change. … We wrote about this because it gave us a better understanding of how people were using that site. Two projects that have come to our site are what are called King Tides projects. I don’t know if we’ve talked about that. Jane: They happen twice a year, but then we sometimes have [sea level] higher than King Tides that will happen with a storm surge or something like that. We’ve been doing a little investigation as to how many King Tides [data-collecting] sites there really are around the nation. Not all of them call themselves King Tides. There’s a project out of Miami called Eyes on the Rise. We’ve been interested in what kind of platform these different projects are using, and what the outcomes are for some of these. We’re thinking of adding features to Anecdata that make our two projects more able to accomplish the kind of goals they’ve laid out for themselves. We have the Gulf of Maine King Tides, and we have Washington State King Tides on there. We’re in the process right now of submitting a big NSF grant [National Science Foundation] that’s due in one and a half weeks, and we’re collaborating with the University of Maine on that proposal, [with] environmental communications people who are going to do some … research around why these participants are involved, how their data are being used, whether or not they’re achieving outcomes. Then we’re going to be adding some new communication and specific-action tools to the Anecdata site and see how that shifts our projects relative to other projects. We’re trying to get a handle on more from the research end: what are ‘best practices’ with citizen science, and how do we know whether or not people are getting out of it what they want to, and whether or not the projects are achieving the goals that they’re hoping to. I think that there’s a lot of data collection that goes on without it getting us where we want to go. Part of that project would be doing some interviews with sites. We’ve picked three – one in South Carolina, one in California, one down in Miami – we’ve been learning from them that even with all the data that they have and with all of the processes that they have in place to share data with coastal planners and municipal leaders, that still there’s overdevelopment continuing to happen at low-lying areas. Flooding continues to be a problem. Jenn: What do you mean by a civic action component? Jane: We’re asking ourselves that question, “What does it mean to be involved?” … We’re calling the grant ‘Data to Action.’ We’ve delineated levels of next steps that people can take: writing letters to the editor, writing an opinion piece, showing up at a planning board meeting, talking to legislators, trying to organize a public hearing …, voting. … People sometimes don’t think about, “I’ve been involved in this project and I’ve learned this,” and then asking that question, “The people I’m voting for, how do they stand on these things that I’ve been working on?” In Maine we have this wonderful League of Women Voters. Jenn: There’s also the Conservation Voters. Jane: Both of them will give you information on how your legislators are doing. It’s sometimes surprising. To me what’s surprising is how divided everything is. You can almost – all the Republicans will vote one way, all the Democrats another. On some key environmental issues, you’ll find that, like Brian Langley for example, 50% of the time will vote the way Democrats will. He’s one of those Republicans who I think is really looking at the issue and thinking about what’s best for the district. I like him. Jane: I have to be honest with you, I have the same bias everyone else does, and if I wasn’t looking at his record, I might just put him in that category with everybody else and say I don’t like him. I think that … recognizing that we can look for these things, they do exist. We’re going to be creating what we call Toolkit on the site, a civic action toolkit that’s going to give a lot of links, and we’re going to try to figure out how to create some place-based links, too, that get people to local news outlets based on their [location] – when you log into the system, it can geo-locate you and knows that you’re in North Carolina and can get you to legislative contacts and your local newspapers and that kind of thing. Then one of the most important tools we’re putting in the Toolkit is a civic action tracker. It’s kind of like what people do with their health or Fitbits or anything else, but it’s a place that you can keep track of your actions, and then track outcomes as well, so that way we can have an idea for a particular project based on website analytics – once we put this tool in place [we’ll know] how many people have written letters. Jenn: Oh excellent, so you’ve got a complete record. Jenn: Or they can use it as a template for their own. Jane: Or they can say, “This is a great idea, do you mind if I use some of your ideas?” That’s the communication piece. We have a forum in there, and I think that we’re going to push [information] out of the tracker into the forum … so you don’t have to enter it in two places. … People can just engage in regular conversation. We’re trying to build community around these groups because that’s another thing I’ve noticed with some of these citizen science projects is that people log in and enter their data … but then unless the project manager is communicating with them, there’s no real conduit for them to be talking to [other participants.] … On our site, we’ve now put in the capacity, once someone’s uploaded a photo, for someone else to say, … “Can you give me directions to this site,” or, “Oh I never thought to look at boat ramps.” … We’re just trying to imagine how people would use these tools. We spent the summer doing the same thing we’ve done for many, many years. [Ed.note: water quality monitoring.] 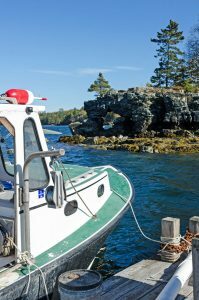 We help the Maine Healthy Beaches, we did all the beach monitoring for Acadia National Park and for Bar Harbor and Mount Desert this summer. Jenn: This is what you’re doing in your lab? Jane: In the lab. So that’s been going on for decades. Every summer we do all the beaches – bacteria monitoring. Then we’re part of Maine Healthy Beaches, we upload the data, we can send out alerts, we can get the beach managers to post advisories. [Ed. note: Healthy Beaches is a partnership between UMaine Cooperative Extension/Sea Grant, the Maine DEP, and local municipalities that monitors water quality at public beaches and issues advisories if, for example, coliform levels are too high.] This summer was so dry, I don’t think we had a single advisory. 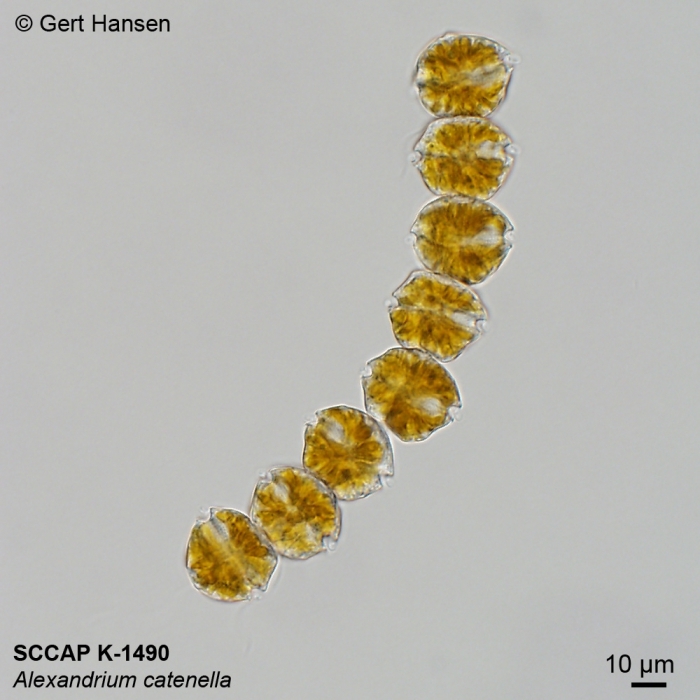 … Then we have for years and years been involved in the Maine phytoplankton monitoring program, and of course this was a terrible red tide year. I don’t know if you’ve heard about it. Alexandrium catenella. Photo by Gert Hansen via World Register of Marine Species. Jane: I think [it was] the largest and longest closure we’ve ever had in Frenchman Bay and the surrounding area. A lot is still closed. Halfway down into Bar Harbor, all the way up to Machiasport, all the way out to Isle au Haut. It’s still closed to mussels. Further downeast there’s a large swath still closed to mussels, clams, and everything. What happens is when a red tide comes in, mussels filter very fast. Mussels will be the first thing closed. … Clams filter slower, maybe because they’re in the sand and not up in the water column, so it takes longer for them to go toxic. … We’ve got different closures depending on where we are, and the toxicity is waxing or waning. 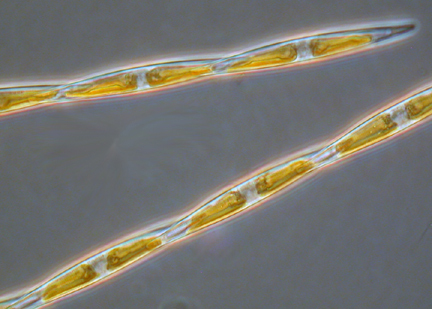 … Typically you’d have these red tide blooms caused by a dinoflagellate called Alexandrium [which has] a neurotoxin that causes paralytic shellfish poisoning, and people usually die … because it paralyzes your muscles, and so you can’t breathe in and out. It affects the respiratory system. Psuedo-nitzschia. Photo by Dr. Rozalind Jester via Wikipedia. Jane: We call ourselves the first alert system because the organisms show up before the toxicity does, so we’re [a] “heads up” to the DMR that the toxicity is coming, and then they check the shellfish meat, then make closure decisions based on actual toxicity in the organisms. Jenn: Do you have certain areas around the bay that you sample regularly? Jane: Yeah, once a week from April to October … for 20 years we have done the Bar Harbor town dock and this dock [at the Bio Lab.] Then for many years I did Bass Harbor, but it’s just a big haul out there. For years I had Tremont School looking at Bass Harbor …, because that’s the first place it hits. These organisms move in from off shore. Jane: Wind-driven, temperature-driven, there could be nearshore nutrients that encourage their replication at the site, or cell division, bloom at the site. … I used to go out to Swan’s Island and Frenchboro, and had those kids involved. … They were like the first of first alert. That’s what I told them. … This was back … like 2007. We managed to hold onto Bass Harbor with volunteers for a number of years, but a year came when I was like, “I don’t have anyone that can run out to Bass Harbor.” So the DMR took it over and we just do Bar Harbor and this upper bay site here, the Bio Lab dock. Tons of data. We’re starting to move it into Anecdata so it’s all publicly available. Jenn: I was just going to ask if you’ve got it up. That’s actually the subject of one of our research questions in the grant we’re submitting in the next week and a half – we’re going to introduce these tools … – the communications and civic action tools – to some projects that have been in place and [where] people have been taking photos for a bit of time. [It’s going to add complexity.] Then we’re going to start a brand new project with fresh people that have never been involved before. When they get started I’ll have these tools already in place, so [they’ll] never know that life was ever any different. This almost gets me more into the social science end of things. This is not my typical kind of questioning or science, but it’s time. After decades of engaging people in the field and on the shore and collecting all these data and then seeing groups like ours coming to the Anecdata site and embarking on the same journey, I’m starting to ask these broader questions about citizen science as a field. I do think that we have something to contribute to it … . It’s not like we’re world-famous, but some of these King Tides projects are. The South Carolina project has been very front and center. Charleston is very low-lying and has experienced a lot of problematic flooding, so they’ve attracted a lot of interest. One of the things about their project though is that it’s run by a state agency, not by, say, the aquarium. As a state agency, they can’t do any advocacy. Jenn: I see, so they can just get the data, but they can’t do anything practical? Jane: They can make it available to anyone who wants to do advocacy, but on the other end, I think advocacy is almost something that has to be nurtured in communities. I still think people just don’t know how. [We can give] them tools to do it. I’m arguing that that’s not advocacy, giving them the tools. … I’m like, “You’re just using a site that happens to have these tools on it. You don’t have to encourage your participants to do anything.” … If you were to say, “Take this action over that action,” or, “Vote for this person over that one,” that’s encouraging advocacy on your part. … In terms of other projects, we just finished this EPA environmental education grant that had people monitoring their wells for arsenic. Jane: In Maine and New Hampshire. It was a big project. We worked with Dartmouth on it. It was what I call school-based citizen science. We had three schools in New Hampshire and four schools in Maine, and the kids all were able to go home and sample their tap water. Then the teachers were able to mail the samples to this trace element lab at Dartmouth at no cost, and then the data came back to our project coordinator here. She uploaded it into an Anecdata-like site on an arsenic website. We didn’t put it on Anecdata, but we are going to move it over there, in part because we had to work out privacy issues on that data. We think we have good strategies whereby all of the place-based information that we need is in the system, but the only thing that people can view will be the arsenic levels. People don’t need to know whose house it was. Jenn: Right. Do they know what town? Jane: They’ll know what town. It’s important to know the community, but they won’t be able to trace it back to individual households. … The bigger data set is being sent to the Center for Disease Control. That’s why we really needed to have all the data. It wasn’t an exercise in looking at the community level, at whether or not there was an arsenic problem. We really needed to get the details into the state database, and the same in New Hampshire. They have what’s called their New Hampshire Department of Environmental Services, DES. They don’t have a [CDC.] It’s interesting, there isn’t a Center for Disease Control in every state, but there are other agencies that function like a Center for Disease Control. Down in South Carolina it’s called the Department of Health and Environmental Control, which is the worst name, I think. Environmental Control. It sounds like you’re going to do something that nature doesn’t want you to do. Jenn: It sounds like an oxymoron. Jenn: Is she the one who was doing the opioid studies? Jane: She proposed to. She didn’t get that funding. Jenn: Oh damn. That’s a fascinating project. Jane: Yeah. I don’t think she’s given up on it, but I think she needs to find the right funder. Like a lot of the work I’m venturing into now, it really falls between categories. It’s kind of a scientific project, but it’s kind of a social science project, and it’s crossing boundaries. … Even as universities are beginning to create more across boundaries, across discipline endeavors, trying to solve complicated problems by pulling people from all disciplines, our funding agencies are still stuck within disciplines. It’s very hard to … I think our funding agencies haven’t caught up with what’s going on on the ground. [Bridie’s] not going to give up. She’s committed her career to the intertidal zone, so that’s why this King Tides project became really interesting to her. The impact of King Tides, or changing ocean chemistry and all of that, has different impacts depending on where you are. Some of our bigger issues here are the loss of these nearshore fisheries [Ed.note: clamming, worming, etc.] in part because we took all of our big fish so we’re left with digging in the mud, whereas down in Charleston and Miami, the bigger issue is loss of property and tourism impacts and that kind of thing. This person from Miami that we’re working with that does the Eyes on the Rise program down there, interestingly, she’s also a journalism professor, which is what Bridie is, technically. … Some of this science-and-advocacy is coming out of environmental journalism, which I find really intriguing. [Eyes on the Rise] have all these amazing sea level predictors. There’s an app they developed where you can zoom in to Google Earth at your own property and then there are these predictive models that lay on top of it and show you what your house is going to look like in 2050. Jenn: Oh god. That’s scary. What is the differential in goals and outcomes of [these projects?] I don’t know. … Some of them are about media campaigns and raising awareness, and others are more about feeding the scientists more information to create more detailed predictive models. It depends on where you are as to what everyone’s motivations are and who’s in charge of it and what agencies are in it and that kind of thing. Interestingly, they all grabbed onto this King Tides hook. That’s the other thing I find interesting. It’s one of the few citizen science projects where it’s been replicated like 27 times in different iterations. … It’s kind of like a ready made experiment because you’ve got all of these projects out there with all these variables at play, and I don’t think anyone’s studied it. Jenn: Comparing the difference between all the different King Tide projects? Jane: Yeah. I’m only choosing a few of them because I think it’s too much to take on, but we’ll see. If we get into it and realize, “That didn’t take long at all …,” we would reach out. It’s hard to predict how long it’s going to take to gear up and then get people on board and get people to give you feedback. Depending on what kind of data you get back, what the challenges are to analyzing it and making sense of it. Anyhow, that’s the new thing that’s happening. Anecdata has been driving this new thinking. Jane: … What I’m trying to also do is let people see that Anecdata might be a project site, but it also could be a research platform. … If you have a site that you can use as a research platform, then you can start tweaking the system and seeing how does that change things, and how does that change things? Because if you just look at what’s going on, it still might not ever get you the answer if you can’t control anything or tweak anything. That’s experimentation. That’s the scientist in me thinking. How can I manipulate this system to get the answer … with people still being willing? There will be a lot of that because this is using human subjects. There have to be a lot of disclosure forms and approval at the university level for the kinds of survey questions you have to ask. Jenn: Oh so doing the surveys makes them human subjects? Jane: If you’re doing it for research purposes. If we’re only doing it for evaluation purposes, sometimes you can get away without what’s called ‘internal review board approval.’ IRB approval. Jenn: Aka jumping through hoops. Wow. Jenn: So you have to think really carefully about your project parameters before you even start. Jenn: Wait, is this all within Anecdata? Jenn: So this is the Bio Lab’s education program? Jane: It was. It started out as a system that we called Education Central where all our education information came in, but other people got jealous and said, “I wish I could track all my chemical inventories that way, I wish I could track all my grants that way, …” So we started to build it out, so now we call it Lab Central. … It’s been amazing. Duncan did it all by himself. … He’s written all the code for it – it’s so customized [and] we are so unique. To get a big course-application software [program] that might be used at a university or something like that was cost-prohibitive and still didn’t deal with the fact that all our courses aren’t the same. We have short courses for undergraduates, we have modular courses for medical doctors. We’re really excited that this is all customized now. Jane: That’s been some diversion of my energies to try to get the whole Bio Lab in good shape, not just my program. But I have Duncan and Anna and Ashley [Ed.note: Anna Farrell and Ashley Taylor], and I’ve cobbled together salaries from multiple small foundation grants. There’s a guy who does arsenic research from Dartmouth, Bruce Stanton, and he wanted to have an environmental summit here a few years ago, and he really wanted to focus it on arsenic and well water because they were seeing this as a bigger and bigger issue in New England, so we decided to host that here. It was very successful. Many people came from different sectors, and we broke into action groups, and we talked about the need for arsenic education. [Arsenic education] was kind of a fit for my lab because … we’re all about water, so ground water was just a stretch for me, not a disconnect. And water quality …, and then our long history of working with schools and communities and pulling stakeholders together. … I thought it was such a good idea that I went for a more national, less regional, EPA grant, which was a little risky because it was very competitive. Like, damn, we got that thing. So we spent the last two years in this groundwater thing, but it funded everybody, it funded part of my salary, it funded part of Duncan’s salary, part of Anna’s salary, so we’ve been operating on that for a couple of years. I talked to EPA, it was a national models grant, and I said, “We’ve created a national model. Where do we go with it now? …” They actually said they don’t have any additional funding for same projects. EPA has nothing to offer. That’s why we’re taking this whole project to NIH, National Institutes of Health, and going at it from a need for people to understand data. The name of this grant is the same thing, Data to Action. I have two data-to-action grants going now. … This EPA thing with uploading the arsenic data and and all of that … – one of the requirements was that [the teachers] integrate arsenic into some science lesson. They had to collect water samples as part of that and get their data back and look at it, and then they had to share their data with their community. The way they shared it was through stories and through role playing and short videos and trifold displays, but what they didn’t do was make graphs. What they didn’t do was data analysis because we didn’t give them the tools. Jane: I made a lot of assumptions about what middle school and high school science teachers would do with data. We had external evaluators on that project who interviewed everybody at the beginning and end, and … the questions I had them asking were about their understanding of the data. What we found out was they learned a lot about arsenic, the dangers of arsenic. “A lot of arsenic is bad. There’s things you can do to mitigate it. It depends on your well. Well filtration is good.” But they couldn’t tell you whether Maine or New Hampshire was worse. Jenn: Wow, that seems pretty basic. Jane: Or which communities were, right? [With] this next National Institutes of Health grant we’re going to reach out to more teachers and kids in Maine and New Hampshire, including the ones we’ve already worked with, and we’re going to get help with this. We’re going to get partners at Colby, Bates, Bowdoin, and some of our other partner institutions in our states. They’re all on board. They’re going to be data mentors. We’ve got scientists out there [saying,] “This is a problem,” and they’re going to be mentors to teachers in schools so that once they get their data, they have help with the data. Jane: Yeah. Then when I said they didn’t have the tools, well we were thinking about inventing those tools, then I found a company that’s inventing those tools. It’s called Tuva. Jane: T-u-v-a. I don’t know what the heck it stands for. Tuvalabs.com. They’re on a mission to increase data literacy in schools. They have this capability to upload any data set, and then give teachers and kids all these cool options for ways to look at it: like let’s look at it like that, let’s look at it like this. It also has all these sample data sets on there that they can … ask questions like, “What way would you like to look at this data? Do you think you should use a bar chart? What’s a bar chart really going to tell you? Maybe you need a box chart …,” you know, so the whole thing talks them through, “What kind of choices will you make to help you visualize the data,” then you can answer questions, and if you … answer them wrong, fail the quiz, then the system takes you back and walks you through again. We’re going to have teacher workshops, we’re going to teach them how to use the software. Jenn: It sounds like a fantastic resource. Tuva K-12 – Demo from Harshil Parikh on Vimeo. Jane: I’m so excited. And, turns out a woman I’ve worked with many years at University of Maine, Molly Schauffler, she’s in the Climate Change Institute there, she’s an educational consultant [with Tuva]. She will come and teach a … mentoring workshop for the scientists who want to mentor. They’re going to have to understand how Tuva works, too. We’re going to become a Tuva state. We’re writing that into the grant, the cost of that. During the five years of this project, all these teachers in Maine are going to have free access to this software for whatever purposes that they’re trying to grapple with data. Jenn: The school itself probably has data it needs to understand. Jane: Yep. They are actually building out – they started for schools, but I can see that they’re building out sites for institutions, and I see they’re interested in citizen science, so I think they’re thinking they’re going to learn a lot by working with us and our arsenic data. This data-to-action, that’s what I have. I have collected data, I have watched other people collect data for a lot of things. It is time to turn data into action. … Does that get at any of the things you wanted to learn from this interview? Jenn: Yeah, you’re up to big stuff! Jane: I’m trying. I might get swatted down. Jenn: Yeah, but you don’t tend to stay swatted down. Jane: But I am venturing beyond my expertise in the well water monitoring, the arsenic, even the data – because honestly we struggle in our own lab with our own data analysis. I make this bold claim in the introduction to this grant, “Everyone struggles with data.” I don’t think there’s ever been a more important time. This is the other argument I’m trying to make … – that people who are rejecting that climate change is real are people who are uncomfortable with data. There have been studies done … where they’ve taken people and given them, like if they’re entrenched on an issue, they’ve given them some data to help sway them and they’re still not swayed, so they give them more data, and they’re still not swayed, so they present them with a storm of evidence, then people actually get – they’ll believe it less. Jane: The more data, the further away they move from acceptance. Data is starting to be problematic, which is why I think these people down in Miami are on to something using all these visual-media-based tools. It’s like people made to see their house underwater, not a CO2 graph. The CO2 graph is the thing that’s disturbing. Jenn: To people who know it means. Jane: To people who know that the whole planet, it’s the whole planet. Jane: There’s complicated layers … but I actually think the shrimp thing … Bigelow Laboratory did a huge study that showed that our plankton level is way down. I don’t know how that might interplay with these … it’s like a whole food chain problem. … It could also be nutrient-driven. We have certain nutrient regimes that have been established over millennia, the way rivers bring nutrients onto land and the ocean. Now we have ice caps melting and diverting, offshore currents with fresh water inputs. I can’t explain it, but it’s what people are looking at are these offshore nutrient regimes that feed systems. Yes it is ultimately temperature-related because we’re losing the ice caps. Again that’s so removed from people’s reality. Jenn: I haven’t seen data for the bay, just for the Gulf. Jane: Well, the Gulf of Maine has had good years and bad years, too, like in 2012, it was the hottest year ever on record, but five years later we’re not having anything that severe going on. I think when you have these oscillations that people “believe it, don’t believe it, believe it, don’t believe it” – they’ve given up trying to understand data. This is the thing that Molly Schauffler wants students to get out of this project and … this data literacy software in particular is that what’s important to understand is variation, and how things vary around the data. Everyone wants to get to a number, but it’s the array of numbers that’s important. … Maybe it takes a whole lifetime to start to get at what the real problem is. It’s about how people perceive things, and how people receive things, and what will motivate people to move to action. I would like to think that behind all of that activity are sound data, but our strategies may not be data-driven. … We’ve made lots of improvements in reading literacy in this country. … We’ve had First Ladies go on their reading literacy campaigns and … everyone has recognized how important reading literacy is and maybe in another generation [we’ll get to] data literacy, have an understanding of numbers. Most of us can’t – I can’t deal with my own finances. I just got my report back on my retirement account that says my fund grew by 1.9% last month. That doesn’t sound that good. Maybe it is. Jane: So then there’s this whole array of choices of different funds that I can reapportion my retirement into. I’m not that good at dealing with those data. On the down low, I don’t even like to tell people what I can’t cope with because I’m trying to help them cope with it. But I think that that generalized data do feed into all aspects of our lives. In ways that somebody would have to do research projects on. You know, 20 years from now all the kids that got this data literacy curriculum, do they have more or less money in their retirement accounts? Jenn: And are their houses under water? Jane: Or to be movers and shakers in their communities and get land use ordinances passed that move back development from the shoreline, or decrease the amount of impervious surface. … We’re in a conundrum, and all I can do is take my little piece that’s based on my couple decades experience and hope that keeps driving some conversations forward and making some ripple effects. I always admire those people that get on the national stage and change things … I’ve always been more interested, I think you are too, at how things play out for people right where they are. I think it’s going to take a hundred King Tides projects, not a King Tides project. I think it organically grew just the right way. 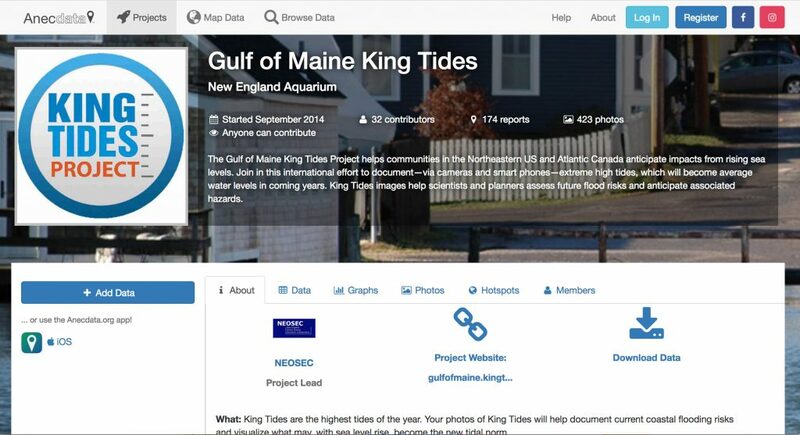 I think one of the things we might find is that the Gulf of Maine King Tides project is too big. Jenn: I don’t think most people here know about it. Jane: Well this was so wonderful to get you up to speed on everything that’s going on. Jenn: It sounds like you have some really, really cool projects. Jane: I’m very excited. You know my kids are off in the world and it’s a good life stage to try to get some things off the ground that have been languishing in my mind. Jane: Because that’s where I play. Don’t put me out in my workplace. I’ll feel obligated to do something. Jenn: Fertilize the eel grass. Jane: So funny. … I’d like to stay in this place anyhow. No matter where I go, I just want to get back here. Do you feel that way? I did a lot of traveling last year. … South Carolina, … Tampa Bay, … out to Santa Cruz to see my sister, … back to New Jersey. … My other sister lives there. I had this big year of travel. It didn’t matter where I went. I was like, Santa Cruz was nice, but it’s crowded and I don’t recognize any of the trees. You know what I mean? … I just want to get home to where I know every bird and every tree. Jenn: I love to travel, I really enjoy being in new places, but I have to come home. Jenn: That would be this island. Jane: Yeah. I knew it when we came here to interview. We came from Washington state. I interviewed at the Jackson Lab in 1989. …We didn’t even know there was an Acadia National Park, let alone that it was here. … When she showed us around the island, we were looking at each other like, “Oh my god. Hope we get these jobs.” We both had PhDs in genetics, so didn’t we luck out that there were a couple of research labs here. Looking back at the Bio Lab campus from the dock. You can see Star Point at the left. Disney, Jane, Duncan Bailey, Anna Farrell, and Ashley Taylor. 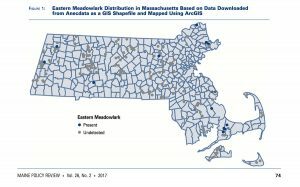 “Next Generation Citizen Science Using Anecdata.org.” Maine Policy Review 26.2 (2017) : 70 -79, http://digitalcommons.library.umaine.edu/mpr/vol26/iss2/15. Visited January 13, 2018. “Gulf of Maine and Beyond: Changing Food Webs in the Gulf of Maine and Beyond,” Bigelow Laboratory for Ocean Sciences, undated. https://www.bigelow.org/science/topics/gulf-of-maine-and-beyond.html. Visited January 13, 2018. Shetterly, Susan Hand, “Profile of Gail McCullough of Hancock, who studies harbor seals in Young’s Bay” (1994). Maine News Index – Maine Times. 740. http://digitalcommons.portlandlibrary.com/news_times/740 Visited January 13, 2018.